Sugar Plum came to GFNJ as part of the brood Mother's Day haul in May of 2013. She has been fostered by Sherry Kilpatrick since she arrived. 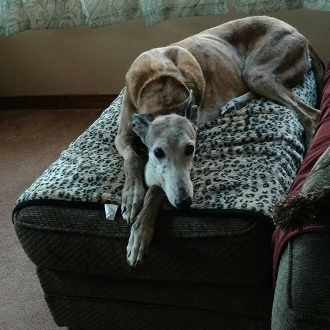 Sugar Plum came with a damaged salivary gland, and has since suffered through a variety of medical conditions, including heart and breathing problems. She could not be spayed due to these issues. Sherry and her husband Mike subsequently adopted 2 of Sugar Plum's offspring. They have provided excellent care of Sugar Plum over these past 4 years. As she was a foster, GFNJ has paid for all of Sugar Plum's medical needs. Sugar Plum needed to be put to sleep recently, with Sherry and Mike by her side. They are devastated. We would like to start up a memorial fund for Sugar Plum that could benefit the next brood or older dog who comes to GFNJ.